For nearly seven decades, The Hackberry Ramblers have played a toe-tapping blend of Cajun music and western swing, with a dash of Gulf Coast swamp-pop, rock & roll, and classic country. 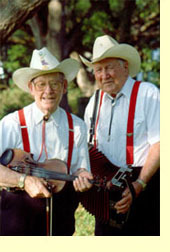 The original founders of the Hackberry Ramblers, fiddler Luderin Darbone and accordionist Edwin Duhon will be honored by the Acadian Museum this weekend in Erath. Beyond their appeal to dancers, The Hackberry Ramblers brought two important innovations to south Louisiana music. They blended the Cajun repertoire with Anglo-American western swing and country songs, and introduced electronic amplification to area dance –halls via a sound system powered by the battery of Darbone idling Model-T Ford. Darbone was born in 1913 in Evangeline, Louisiana. His father worked in the oil fields and his family moved frequently. When Darbone was 12, his mother gave him a fiddler. With no teachers available, he taught himself via a correspondent course. As a teenager, Barbone began playing house dances in Orangefield, Texas. He focused on the country style known as hillbilly string-band music and the newly emerging, jazz-influenced soul western swing. In 1931, the family moved to the remote oil-field town of Hackberry, deep in the marshes of Southwest Louisiana. There, Darbone met a neighborhood guitarist named Edwin Duhon and they began playing together. In 1933, Darbone named the group The Hackberry Ramblers. Duhon was born in 1910 in Youngsville. Like many Cajuns, he was raised speaking French. When is school, Duhon was forbidden to speak French and when he did so, he was spanked. As a teenager, Duhon began playing the guitar. Duhon, worked overseas as an oilfield hand and electrical engineer. When Duhon would return to Louisiana, he’d find that someone else had taken his place as a member of the Hackberry Ramblers. Undaunted, Duhon would simply learn a new instrument, eventually mastering piano, accordion, bass, drums, guitar, and harmonica. The current line-up also includes electric guitarist Glen Croker and drummer/producer Ben Sandmel. Johnny Faulk, the Ramblers' bassist since 1979, passed away in October, 2004. On September 18th, Darbone and Duhon received a National Heritage Fellowship from the National Endowment for the Arts, in Washington, DC, followed by a full band performance at a concert by the diverse assemblage of award recipients. The Hackberry Ramblers are still thrilling audiences around the world - from New York’s Bottom Line to The Grande Ole Opry, from The Broken Spoke in Austin to the New Orleans Jazz & Heritage Festival, from The Kennedy Center in Washington to The Strawberry Festival at Yosemite, from Cajun-Zydeco festivals in Holland to country music extravaganzas in France, to the Newport Folk Festival.